Editor’s note: January 9 in Manila is one of the most well-known and largest religious celebrations in Manila where millions of devotees to the Black Nazarene, an ebony-colored statue of Jesus Christ carrying the Cross, flock around the streets of Quiapo in several mile-long procession. This annual procession, believed to be miraculous by its devotees, lasted 19 hours this year as it ended early Saturday morning January 10. Two persons died, one of cardiac arrest while escorting the statue. Another person was pinned under the massive crowd in Quiapo when the crowd was leading the Black Nazarene statue to the church. The procession commemorates the first procession of the statue from a church in Intramuros to Quiapo Church in January 9, 1767. Pasig resident Oliver Demano filed this first person account of the phenomenon “Translacion ng Nazareno.” He graduated from the Mapua Institute of Technology and works as an engineer for Static Control Components Hongkong. This was my first time to witness this Procession of Black Nazarene January 9, 2015 or as Filipinos call it “Translacion ng Nazareno” or the transfer of image to its shrine. Perhaps my initial motivation to see this event was to satisfy my curiosity. Millions of devotees came from all over the country to Quiapo, Manila. Most of devotees, predominantly males, walked in barefoot showing their penance to Black Nazarene. 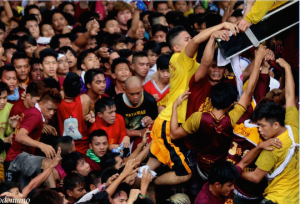 First, I wanted to find out why these believers had to risk their life just to touch, kiss or hug the Black Nazarene. Secondly, how these believers manage to reach the carriage of the Black Nazarene against the flock of devotees. At the end of the day (actually it was a two-day procession) I was convinced this Procession had exalted our people’s faith and devotion to God once more, perhaps removing our emptiness or probably define for many a feeling of salvation. Hijos wipe towels to the image and throw these back to the crowd. Devotees came from different places -family of devotees, some were associations or group that can be identified by their shirts or banner, some were tourist and some were uzis (usiseros at usiseras). The celebration of the Holy Mass started in Quirino Grandstand attended by 12 million (as reported by the news media) devotees. 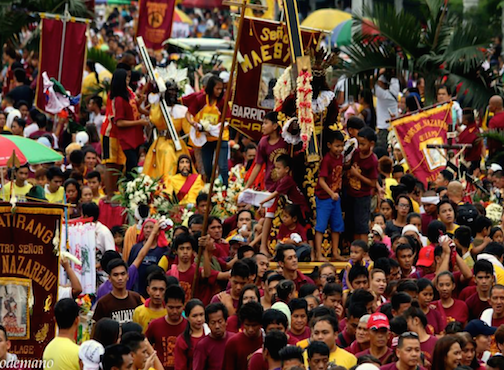 The procession was delayed by 2-3 hours due to issues on Black Nazarene’s ‘caroza’. “Hijos” are young devotees who are allowed to ride on carozas in order to protect the image, give directions when to go and when to stop; and also to wipe towels/hankies that were being tossed to them by other devotees to wipe on the face of the image and return it back to owner. Touching the image brings “sanctification” to the towels believed to acquire miraculous healing power. Hijos also assist devotees who want to climb the carriages and kiss the image. They said that anyone who touches/kisses the icon on the Feast of Quiapo (every 9th of January) will be cured of diseases both body and soul. I saw devotees bringing their own Black Nazarene replicas to be blessed during the procession. Devotees waiting for the arrival of Black Nazarene began around 7am. A devotee that I talked to, Leonardo from Novaliches, said it was also curiosity that motivated him to join and try to reach/kiss the Black Nazarene. It was an exhausting experience, he said, but when he reached and held the rope that pulls the carriage of Nazarene- he suddenly felt isolated. It seemed to him that he was the only person pulling the rope for a few seconds. He cannot explain this phenomenon. The present-day statue enshrined in Quiapo Church is in fact a composite of the original head and a replica sculpted by renowned Filipino santero (saint-maker) Gener Manlaqui, as commissioned by the Archdiocese of Manila, according to Wikipedia. A second composite statue, comprising the original body and the head of the Manlaqui replica, is normally stored in a different location and brought out only for the three major annual processions. This arrangement began in the 1990s because of security concerns for the image as well as the to prevent further damage to it; up to that point, the original image in its entirety was processed. Again according to Wikipedia, the original statue was made by an anonymous Mexican sculptor, and the image arrived in Manila via galleon from Acapulco, Mexico, sometime in the mid-1600s. Traditional accounts attribute the color to factors such as votive candles offered before the image; artistic license by its sculptor; or the most widely-held belief, which is that it was charred by a fire onboard the galleon that brought it from Mexico. Sabino A. Vengco, Jr. from Loyola School of Theology noted that the image was not charred but in fact dark through to its core, as it was carved from mesquite wood. Vengco based this claim on personal research in Mexico, where he said the wood was a popular medium in the period the statue was carved, and likened it to Our Lady of Antipolo, of similar provenance and appearance. The surviving image has been enshrined in the Minor Basilica for centuries, withstanding several fires, earthquakes and war. Young and old cling to get near the Nazarene. People waved white cloths and handkerchiefs, to be blessed through the ritual of the procession. They chanted “Viva Senior Nazareno”. Some cried when they reach the Black Nazarene caroza. I had an opportunity to talk with two other devotees- Ian Leonardo from Novaliches and Gerbin Estella of Farola. Both had been devotees for quite some time. 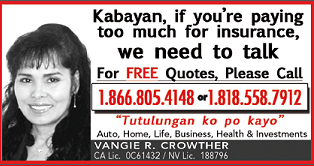 They said it is not a joke to try to reach the “Nazareno” and one has to have the proper training from other devotees, otherwise they could sustain major injuries, even be crushed to death. Gerbin said he always felt salvation not for himself but salvation of his whole family every time he kissed Black Nazarene. He said “gumagaan ang kalooban.” Although he said, sometimes he can’t resist temptations. For different people there are different experiences but they are bounded by one faith. One of the devotees I talked to said after reaching the top of the carriage, dismounting from it was the most critical part. “You need to put your feet on any of the people’s shoulder and just have faith that they will catch you safely… Of course you never know. If it is your day, it’s your day… if you need to go.. end of your mission… period.” Faith in God, faith in their fellowmen, was written in the faces and mind of the devotees. Devotees held tightly to each other’s arms to avoid being crushed. Soon I realized that it’s our Faith that makes us strong as a people; to do what is impossible, to do what we believe in. It is Faith that somehow puts our life in order. 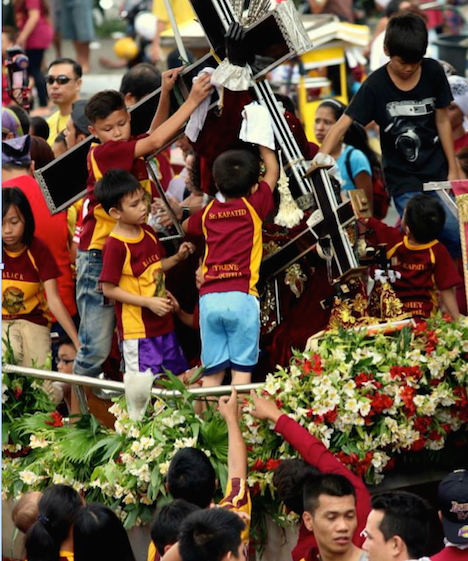 Faith in the youth, as many children were carried forward to reach the Black Nazarene so they could kiss or even touch the Black Nazarene. I know this tradition will never die as it is passed on to generations as it had been for hundreds of years. Devotees (young, old, male or even some female) had risked their life to reach and touch once more the Black Nazarene against the tides of other devotees. I will always remember this procession as only for the brave and for the worthy, if you will, but I will always think of it as the “Mystery of our Faith” as a people. 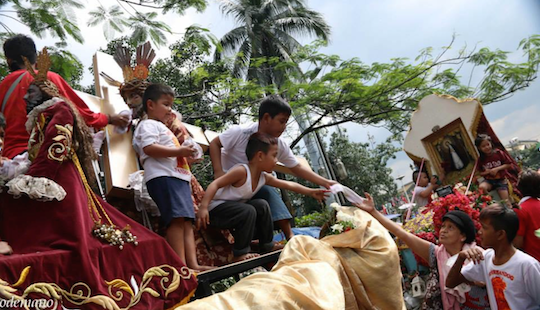 Police estimates some 12 million devotees attended the annual pilgrimage to Quiapo.